Growing food indoors employing advances in lighting, automation and information management is a emerging multi-million dollar industry. Dr. Stein has served as a consultant to municipalities and business interested in setting up indoor farms. He authored a two-hundred page report on the dynamics of this industry and the feasibility of setting up a Center of Excellence for Indoor Agriculture. The full report may be downloaded free of charge from KennettIndoor Ag.info. Dr. Stein has spoken on indoor farming at conferences including Indoor Ag-Con, FreshTech, to the City of Philadelphia, as well as run workshops for the USDA on indoor farming. In addition to his academic credentials, Dr. Stein designed and operates an indoor vertical farm in Media, PA to conduct applied research on the economics of indoor farms. His farm, e3garden, specializes in lettuces grown from organic seed, herbs such as basil, and microgreens. The farm collects data on operating costs including energy for heating, cooling and lighting as well as labor, supplies, etc. Produce from the farm is sold at local farmer’s markets, to area restaurants, and to consumers directly through a CSA. e3garden employs interns from local colleges and universities. Dr. Stein’s expertise as a faculty member and consultant include fostering creativity, motivating innovation and starting new ventures. His work includes ways to measure creative behaviors using his Creative Strengths Survey, which is available at ideasmethod.com. His books, written especially for leaders, managers and professionals include Fostering Creativity in Self and The Organization: Your Professional Edge and Designing Creative High Power Teams and Organizations. 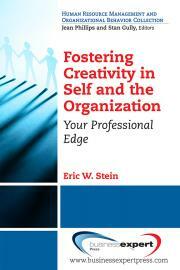 Fostering Creativity in Self and The Organization: Your Professional Edge helps individuals, and their organizations, learn to maximize creative potential. The book explodes the myth that creative people are born rather than developed through practice and hard work. All people are creative and have the ability to be innovative, not just artists, musicians and writers. The Professional Edge defines these skills and demonstrates how to develop them. These are the skills required of 21st century professionals. Designing Creative High Power Teams and Organizations helps leaders create great organizations. The very best firms today are poietic organizations; that is, they are exceptionally good at streamlining the processes of ideation, creation, and production. Poietic organizations do the following things well: (1) they design and develop high power teams and (2) they create an organizational culture and context that supports improvisation, design, experimentation, aesthetic awareness and strengths development. 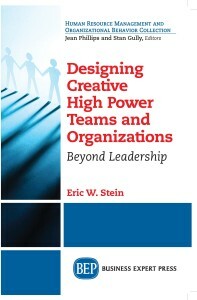 In short, this book is about how to design and develop creative high power teams and organizations. Dr. Stein has a Ph.D. in Managerial Science from the Wharton School of the University of Pennsylvania and a BA in Physics from Amherst College. He has published numerous books, articles and academic papers in theoretical and applied research journals for business, management, and policy. Dr. Stein has been a civic leader and Councilman in Media, PA. He was elected in 2009 to represent multiple stakeholder interests: businesses, residents, community groups and visitors. As Councilman (2009-2013) he served on several committees including Information Technology, Business, Environment, Finance, Community Development, as well as several ad hoc committees. Since 2013, he has been a member of Transition Town Media (TTM) and part of the Energy Sub-Committee of TTM where he has served in the capacities of public outreach and planning for the Solarize Greater Media project, which helps homeowners obtain solar power at a reasonable price. Stein is the creator and owner of a software development and management consulting company and has a keen interest in energy policy, green technologies, small business development and community development. He has served as a guest columnist for local papers regarding small business, energy and the economy. In 2011 he started a high tech indoor farm, e3garden that provides quality lettuces and herbs grown from organic seed without pesticides. Stein regularly performs with jazz groups in the Philadelphia area on sax and piano. He is a certified ski instructor and has skied all over North American and Europe.